You're sitting in on a multiple deck game where doubling on any two cards is allowed. You're dealt an 8 and a 3 for a two-card 11. You're playing against the dealer's upcard of seven. 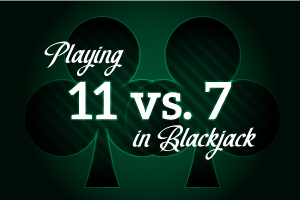 If you are familiar with the rules of blackjack, getting an 11 should set off a signal in your mind. Therefore, your decision here will basically involve whether to double on that two-card combination or simply hit. So which is it going to be? Well, naturally the correct play is to double this hand. Some plays in this game require a cerebral exercise to understand. But this one is really a no-brainer. The player who always doubles down in this situation is going to wind up winning 57.5% of the time with those doubles (losing about 35%); meanwhile, the winning rate to be achieved by hitting is just 59% with the single (original) bet. Consequently, the positive expectation for this hand is far greater for the player who always doubles the hand than for the player who always hits the hand - 64% more, in fact. From a practical standpoint, the dealer, if he is going to be "pat' (possessing a standing hand) will be getting there with a 17 more often than with any other result. Having an 11 is a very good situation for a player to be in. It is incumbent upon the player to take advantage of the "gimme" plays (or the closest thing to them) that come down the pike.